Sergey Karjakin won the 2015 FIDE World Cup in Baku, but only after one of the most incredible finals you could ever hope to witness. 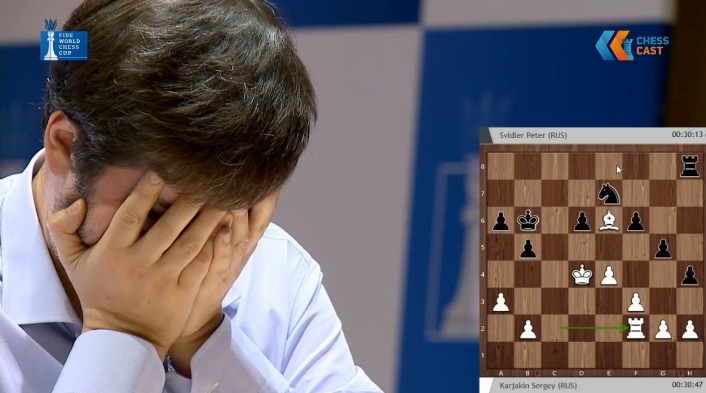 Peter Svidler seemed on course to cruise to victory with wins in the first three classical games, but a slip in Game 3 gave Sergey a lifeline and led to another seven games – all of them decisive! The players later talked to Vladimir Barsky and gave a revealingly in-depth account of what actually happened. In this first part we look at the four classical games. Although after many of the games we heard from one of the players in the post-game press conference, Vladimir Barsky’s interviews for the Russian chess magazine 64 are the first to really explore what happened at the critical moments. 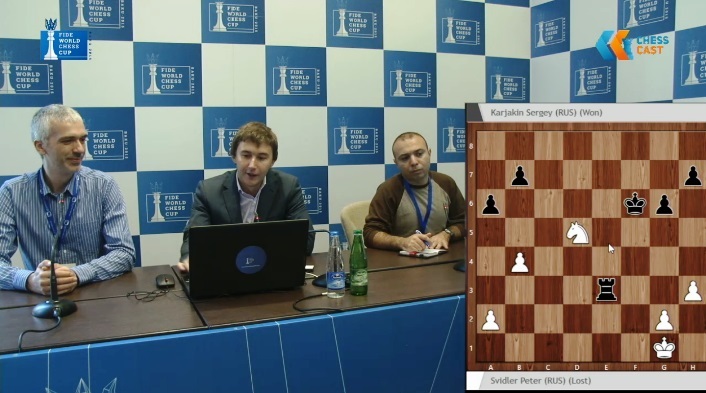 For instance, Peter Svidler goes into great depth about exactly what went wrong in the fateful third game. 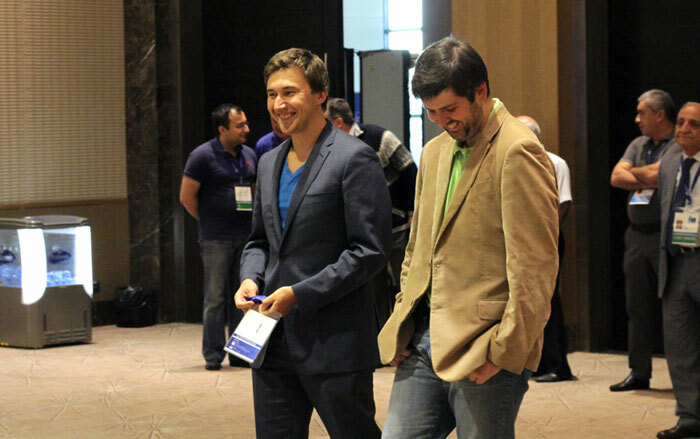 The interviews, which cover the whole World Cup, were reproduced on the Russian Chess Federation website – Karjakin | Svidler. For chess24 we’ve translated the players’ comments on the final match and combined them into a single narrative. In this first part we focus on the four classical games. Svidler: And then there was the first “warning light”: I could have taken a three-fold repetition, but I didn’t. That had no influence whatsoever on the result, since by that point I was already absolutely sure that my position was not just holding, but simply no worse. Nevertheless, the fact remains: it turned out I was in no condition to count up to three iterations. That fact should, no doubt, have given some cause for concern. Then the final. The final was a whole new story. Barsky: Before the final you had two rest days, and you already had a ticket to the Candidates Tournament in your pocket. Did you feel everything had already gone well and there was no reason to keep on playing? 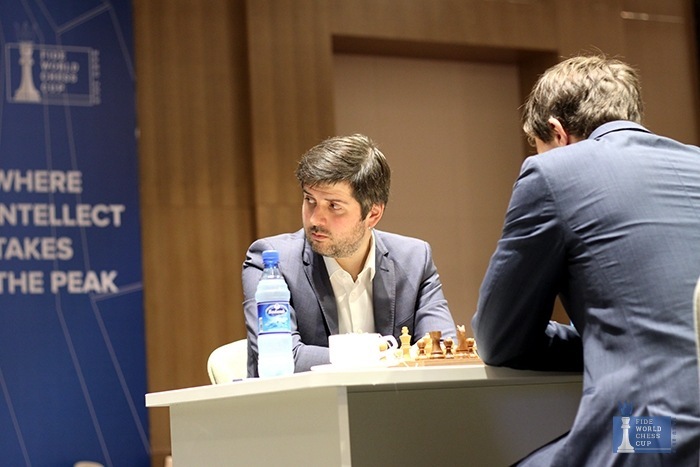 Svidler: It’s clear the main task had been accomplished. I’ve declared more than once that I like Candidates Tournaments. I like to play them, although that doesn’t always go so well, but the very process of playing and preparing for Candidates Tournament attracts me. So that was an important goal. And when it had been achieved the two rest days did, of course, help a lot, because I managed to readjust pretty well to actually playing the final. 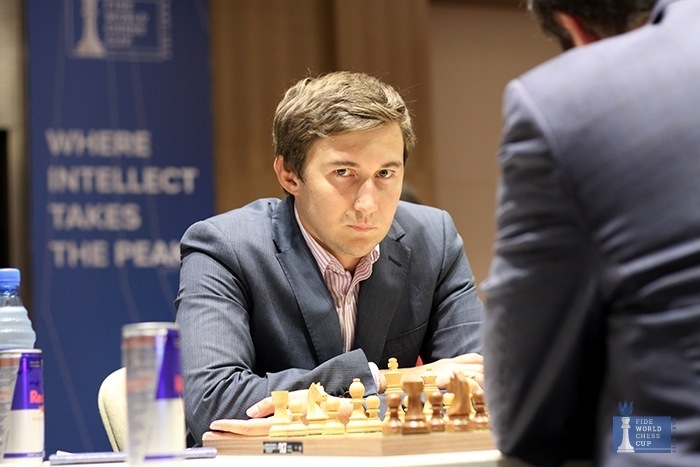 Sergey Karjakin, meanwhile, required 26 games to reach the final, with his semifinal against Pavel Eljanov developing into a real thriller that was only decided by a fortuitous 3-fold repetition in the sixth game. Sergey had battled his way to a place in the 8-player Candidates Tournament in spring 2016 that will decide the next World Championship challenger for Magnus Carlsen. Barsky: Well, now the most interesting part was starting – the final match! Karjakin: For the spectators that was the most interesting part, but not for the participants. You have to add a reservation: we both considered our main task complete – we’d qualified for the Candidates Tournament. And it was necessary to find additional motivation to continue the struggle. Just as he did in 2011 against Alexander Grischuk, Peter Svidler started the World Cup final with a win. Barsky: Did you feel the desire to win the Cup? Svidler: There was no problem whatsoever with desire, absolutely none! And for a long time there was the feeling that I was in pretty firm control of the process. I won an excellent first game. I got what was objectively a bad position from the opening, but roughly the kind I wanted to get. And you need to bear in mind that Sergey had the toughest of semifinals, where he had to invest an inhuman amount of effort. First he saved a very dubious position in the first classical game, then with White he failed to get a fight. Then he came back after losing the first rapid game. The third and fourth games were also both dramatic. Karjakin had one less rest day than I did, and it was clear he was very, very tired. And when he then started to commit inaccuracies I exploited them to the utmost, it seems to me. Of course you can’t call 29 moves a miniature, but it turned out to be a totally convincing first game. Karjakin: I fell victim to a psychological mistake: my body relaxed and there was the feeling that the tournament was over, while in actual fact I still had to play the fearsome Peter. So the first game went badly. The only thing I’d like to explain is why I went for all those exchanges after 16.d4. I understood perfectly well that besides 15…Rf7 there were many other moves, but I was sure that after 16.d4 bxc3 17.bxc3 cxd4 18.cxd4 Nxd4 19.Nxd4 exd4 he would play 20.Nc5, and in that case it’s important that my rook stands on f7. In that case everything is exchanged and you get a logical draw. But he went 20.Qb3, and I simply understood at that moment that in return for a pawn White has crazy compensation. I quickly replied 20…Rb8, and it turned out that after 21.Rb1! Black simply doesn’t have a move – in actual fact it’s a hopeless position. Yes, I still had some micro-chances, if after 21…Qd7 22.Rec1 I chose not 22…Qe6 but 22…h6, although, more likely than not, I’d still have lost the game. 23.Nc5 Bxc5 24.Rxc5 Rd8 25.Ba5 Rd6 26.Qc4 Nc3 27.Rxb7 Qe1+ 28.Bf1 Ne2+ 29.Qxe2 Black resigned. Well, it was my fault: Peter withstood the tension and I didn’t. For much of the second game it looked as though Sergey Karjakin had good chances of levelling the score, but there was a sting in the tale. Svidler: The second was something of a case of being too clever for my own good, although if not for that it’s more than likely I wouldn’t have won, so there was nothing to complain about. I could have demonstrated a long forced line where I would have sunk into thought at around move 30 in an absolutely equal position which I knew, but since he switched around moves in the opening a new option appeared. And instead of spending about 30 seconds to grasp that the move 19…dxc3 doesn’t lead to a quick draw offer, and deciding I had no need of it, I spent half an hour, went astray in my calculations and got a dubious position which, nevertheless, I held quite convincingly. And at that point, when the game should have ended in a logical draw, a catastrophe occurred. You might say the blunder Sergey made was unparalleled at such a level but, as we know, there was no need to wait long for some parallels! Karjakin: The second game started with Svidler preparing a serious improvement on my game against Carlsen, where I had a big advantage. However, it’s better to ask Peter about opening subtleties. It seemed to me that overall I played decently, finding a way to continue the struggle, although it was always round about equal. Here I spent a lot of time on the move 34.g3. It seemed to me that Black has a single idea – 34…Nd7, and then 35.Bd5. Now it’s bad to play 35…Qc7 because of 36.Bxf7+ Rxf7 37.Nxf7 Kxf7 38.Qd5+, so he needs to play 35...Qb5. And after 36.Bc6 even 36…Qxe5 makes a draw, while the simplest move is 36...Qc5. The move 36…Qc5! is shown by the computer, but at the board it seemed to me that Black should take on е5 and it would be a draw. Nevertheless, it was necessary to play like that. I saw that objectively I had nothing and came up with a “subtle” rook manoeuvre. 34.Qd4 Nd7 35.Nxf7 Rxf7 36.Rb2 Qc6 37.Rb5? I considered Black’s main idea to be 37...Bc5, when my last move is a trap: 38.Rxc5! Qxc5 39.Bxf7+ or 38...Nxc5 39.Qd8+. But it turned out that I’d led myself into a trap. If one game defined the 2015 World Cup final it was this one, where Peter Svidler came incredibly close to winning an unprecedented second title without losing a single game. Svidler: I was leading 2:0 and I was asked at the press conference, “Do you consider the match to be over?” I was completely honest when I said no. I understood perfectly well that while the battle wasn’t just beginning the third game wouldn’t be easy, since the proximity of a great human triumph exerts its influence. Nevertheless, I also managed to prepare normally mentally for the third game. I got a position which was quite hard to play, but I successfully resolved all the problems that arose. Barsky: But still, you had to go straight onto the defensive with White? Barsky: That was just the impression it gave? It was pointed out to me afterwards that there were some nuances that would remove that impression and it was possible not to suffer at all, but I didn’t find them at the board. The position was one where every tempo counted, but I had a very healthy structure. Yes, my pieces look a little clumsy, but if they get out then I’ll be able to dictate my conditions: if I need a draw then I’ll make it from a position of strength. And if I don’t need a draw then White will apply pressure. At that point, influenced by the match situation, Sergey went all-in. After 22.Qc5 he sunk into thought, spent two thirds of his remaining time and played the move 22…Rf6, which objectively isn’t very good; 22…d4 struck me as stronger. But after 22…d4 some endgames would arise in which, on balance, White shouldn’t have serious problems. And since he had to play sharply for a win he moved his rook to f6. Karjakin: It seems to me that up until this point I’d played an excellent game. But after the logical 22...d4 23.Qxf5 Rxf5 I evaluated the position as drawn. To be more precise: Black can try to play for a win here, but I simply didn’t believe I could win, because objectively it’s a draw. If the match situation had been normal I would of course have played like that, but here I thought that it would be better to die like a man! Svidler: I gathered myself together, found the move 23.b4 and found 25.Qe3. In advance I wanted to go for 25.Qc2, but in that case there were some endings where Black could at least imitate some kind of activity. I calculated it all and withdrew my queen to e3. Karjakin: Initially I had the idea of playing 25…Nf4, but then I didn’t like 26.d6 Qg5 27.Qf3. Strangely enough, I still seem to have some kind of draw there, but nothing more. So I changed plan. Karjakin: I’m offering to switch to an apparently equal ending, but it’s not so “barren”, since my king can become active. Svidler: Before this move I sunk into thought, since I realised that I can start to exchange pieces, after which, more likely than not, I won’t lose. Barsky: The computer considers 27.Rfe1 to be even stronger. Svidler: Frankly, I didn’t see that move, because it’s counter-intuitive, since after all the knight is hanging on f2. In principle, it would be possible to start whipping off pieces. Probably it’s slightly more pleasant for Black due to the fact that the king is closer to the centre, but it’s clear that White isn’t taking any big risks. However, it seemed to me that after 27.Rbe1 I could fix match victory, because I had an advantage there – the pieces are exchanged in a more successful version. And if they’re not exchanged, then I can pick up material immediately. This move loses; objectively Black should have captured on e3 and made the move Ref8. Perhaps he’d have good chances for a draw there, but that suited me down to the ground. Therefore I’d focused exclusively on the move 27…exd5, which, I understood, is Black’s only attempt to continue playing for a win. My first reaction when I started to study the variation 27.Rbe1 exd5 was that in this position with the move 28.Qc3 I pin absolutely all the black pieces and should win. I started to explore 28.Qc3 and saw that both after 28…Qf4 and 28…Qf5 you still need to calculate some variations, and after all, there are nerves and not so much time… And I told myself: “Ok, let’s put that option aside and see if there isn’t anything better”. And then it occurred to me that I can play 28.Rxf2, and after that he’ll pick up all my rooks, I’ll play Nxd5 – a fork, and I’m left with a knight while he has a pawn. I rechecked that variation five times. As I recall now I asked myself: “Are there any candidate moves other than 28…Qxe3?” And I confidently answered myself that there are no other candidates. I went outside into the foyer and Sergey sunk into thought. While he thought I rechecked all those variations another five or so times; as before no other candidate moves came into my head. He played 27…exd5. I sat down at the board and rechecked those three moves that I saw for Black another couple of times. I confirmed that I’m left with an extra piece and went 28.Rxf2. And after 28…Qh4! I didn’t manage to readjust to the new landscape. Karjakin: Natually I saw the move 28.Qc3, but it seemed to me important that in reply I play 28…Qf5 (28…Qf4 29.Nxd5), and then 29.Rxe8 Nxh3+ 30.Qxh3 Qxf1+ 31.Kh2 Qf4+. But in actual fact it’s very strong to play 30.Kh2! Qxf1 31.Nxd5. I didn’t see that and tried to play fast. If he’d found that variation that would have been it, he’d have won the game and match. However, he was distracted by a beautiful idea: 28.Rxf2, relying on 28…Qxe3 29.Rxe3 Rxe3 30.Rxf6 Kxf6 31.Nxd5+. But there was the move 28...Qh4! Many years of experience help you gain some kind of understanding of what’s happening on the chessboard. When I played 28.Rxf2, I thought it was the logical conclusion to a game in which I’d resolved all my problems. And now, since my opponent had gone all-in, turning down drawing continuations, at some point he’d gone wrong in the variations and I was winning. But when I saw the move 28…Qh4 and grasped that that harmonious picture of reality no longer corresponded to the actual reality, it was an extra blow. I thought – I have to calculate variations. After 29.Qxe8 you get some kind of heavy piece ending where I’m either holding or not holding; at a glance it’s not obvious i.e. the computer says that you need to make two precise moves, and White isn’t worse there at all: 29.Qxe8 Qxf2+ 30.Kh2 Qxb6 31.Re7+! Kh6 32.Rd7! But the moves 31.Re7+ and 32.Rd7 were ones I might also not have made – they’re not so obvious. They told me about that after the tournament was over, but I didn’t put the position on the computer, so it only went round in my head. And after a few days of passive analysis I hadn’t found the move 32.Rd7, so there was no guarantee that I would have played it at the board. Nevertheless, I needed to at least take the rook on e8, after which the struggle would have gone on. Karjakin: The position was very tactical and he could lose the thread, not because he sees tactics badly but because there are too many. He had a way to save himself here, but he’d have had to find a very strong manoeuvre: 29.Qxe8 Qxf2+ 30.Kh2 Qxb6 31.Re7+ Kh6 32.Rd7! But that’s the kind of challenge you might not be rise to. I thought I might already have chances there. It’s better if he explains himself why he went 29.Qd2, but as far as I understand it he blundered that after 29…Rxf2 30.Qc3+ d4 31.Qc7+ there’s the move 31…Rf7. 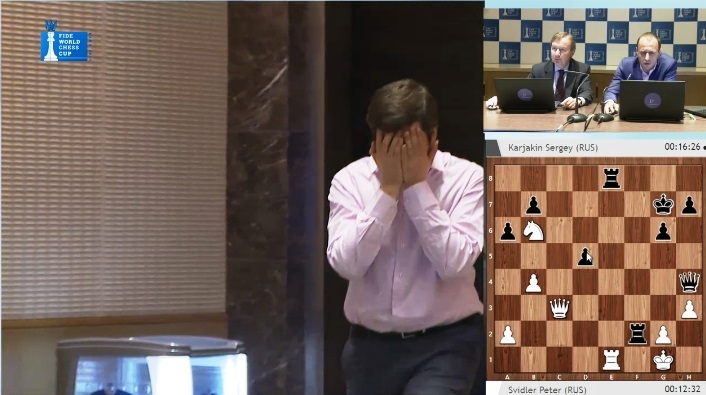 Svidler: I had no desire whatsoever to conduct a tough defence, and so I thought: “Can’t I get out of this in some tactical way?” And… it never rains but it pours! On the previous move in response to 28.Rxf2 I’d looked at the absolutely pointless move 28…Qxb4, but I hadn’t considered 28…Qh4. And now I started to calculate: 29.Qd2 Rxf2 30.Qc3+ Kf7 or 30…d4 31.Qc7+, and on the next move I’ll take the rook on e8. Then those two variations (30…Kf7 and 30…d4) merged into one. And I thought: “Great! Yes, I blundered 28…Qh4, but thank God that didn’t affect the evaluation”. And I quite quickly went for 29.Qd2. Sergey looked at me somewhat strangely and took the rook – 29…Rxf2. I play 30.Qc3+, he plays 30…d4, and suddenly I realised that after 31.Qc7+ you can’t only move the king out of check. As a child it was explained to me that you can also block a check. That news came as a surprise to me, because I sincerely believed: check-check, the king should move from g7 and I’ll take on e8. Karjakin: Of course you can say that I got lucky; on the other hand, in the previous game I also wasn’t obliged to give up a bonus half point. Therefore overall, if there had been two draws, the course of the match would have been more or less logical. Svidler: So instead of “hurrah!” it turned to “help!”; instead of two free days and some sightseeing in Baku I needed to somehow play with Black. The fourth game was absolutely horrible in terms of quality on my part. Sergey didn’t play ideally either, but nevertheless he didn’t completely let the advantage that he gained out of the opening slip. The first part of the plan went great: by the time he got to the critical position Sergey had spent half an hour. And here he made the move 10.f3, which objectively, perhaps, is third rate. Of course it had also been looked at, but since from the point of view of posing Black problems it’s behind other candidates it wasn’t looked at very deeply, and I didn’t repeat it here once. And you have to take into account my mental state after the third game: the moment I was given the chance to think I spent 20 minutes and went for 10…h5? That move was a crude positional mistake: Black loses a tempo and also spoils his structure, weakening the g5-point, where a bishop immediately planted itself and couldn’t be evicted. Plus I’d passed the right to move to White, and in the given position that’s something he really doesn’t mind at all. I’ve dwelled on this moment in such detail because people have criticised the opening choice, but it wasn’t a spontaneous decision taken at the board – to start to exchange pieces. The variation had been studied in very, very great detail, and if we’d gone for the main lines no questions would have arisen: the spectators would no doubt have realised how deeply it had all been studied. And after 10.f3 the move 10…h5 can’t, of course, be explained by anything other than some kind of mental debility. Karjakin: I won the fourth game – I got a big opening advantage, although frankly I didn’t prepare this variation at all. You can already consider 10…h5 a mistake; it was stronger to play 10...Kc8 immediately. I’m not going to claim that the whole variation was bad, since nowadays almost any position can be worked out to a draw, but the play is clearly for two results and I wouldn’t want to defend something like that. In my view it’s an inferior Berlin, although perhaps I’m incorrectly evaluating the position. Barsky: It seems that after 11.0-0-0 Kc8 12.Bg5 the move 12…Be8 would still have held the black position together? Svidler: Yes, I saw the move 12…Be8, but it seemed to me that there’s no longer any kind of equality there. The bishop should be on d7 and it doesn’t need to be touched. The fact that the computer suggests going 12…Be8 to avoid any immediate disaster shows just “how far I'd fallen” and the whole absurdity of the 10…h5 idea. Barsky: Alexey Bezgodov recently wrote a book on that opening. 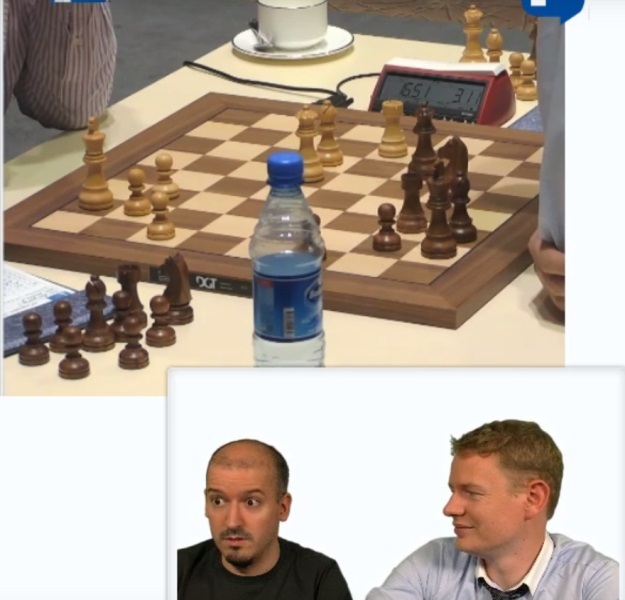 Svidler: Yes, I've read about that; it’s nice to see that I’m promoting the ideas of Bezgodova to the masses. But, as I already said, we prepared this opening before London 2013. It’s a pity I provided such publicity for the line, because it’s absolutely innocent in all this. Overall, on that day it was very important for me to make as many moves in a row without thinking as possible, because my head, of course, was a little traumatised by the events of the previous day. Karjakin: You can’t play 12...a6 on account of 13.Na4!, but the move in the game surprised me. Perhaps he’d blundered my reply? It seemed to me that the game was almost won, and in what follows I began to squander my advantage. It was important to play 18.Bh4! here. I saw the move itself, but I didn’t spot that after 18…f5 there’s 19.Nf4! It seemed to me that I’d tied him up beautifully: you can’t play 19…a6 because of 20.Nb6+ or 19…g5 due to 20.Nf6+ and Nxh5. I couldn’t see a reply for him, but he found 19…Kd8! – a very strong move. It was probably better to retreat the knight to f4. It seemed to me that here as well I keep an advantage, but it’s pretty small. Yet another strong move; in general, he defended well. At first I had the idea of going for the rook ending, but then I realised that I’d be squandering my advantage. After 24.Bxc6 bxc6 25.Rdc4 c5 26.f4 Re7 27.e5 g5 28.exd6+ Kxd6 the position is close to a draw. I had six minutes left, but that had no significance since the position was an endgame. I realised that my last chance was to maintain the tension and retreat the bishop, after which, at the very least, the game would go on. I was giving him far more chances to go wrong. I saw the move 28...f5!, but I thought I’d still be better, although it was clear that I’d given up the lion’s share of my advantage. But after 28…g5 I ‌already have chances: the king comes into the centre and later I have the idea of f3-f4. Black faces an unpleasant defence. Deep concentration or that sinking feeling? Of course he needed to go for 44…d5 45.e5 fxe5 46.Kxe5 d4. At the board it was tough to evaluate that position, but it seemed to me that White was better. On the other hand, the d4-pawn is strong. Naturally I was expecting that continuation, while the move 44…Re8 was clearly connected to some kind of oversight. Now after 45.g3 Ne6+ I had a forced win, and I’m glad that I managed to cleanly convert my advantage. A brutal move. After 51.Rxf6 Rxg4 the battle would still go on. So after 23 days and countless games the World Cup would be decided in rapid and blitz chess on the following day. Barsky: The score had been levelled. Did you manage to rouse yourself again before the tiebreaks? Svidler: Yes, I nevertheless managed to get myself back to something approaching normality. I was actually a little embarrassed about the fourth game, because you shouldn’t play chess the way I played in the fourth game. The tiebreaks didn’t leave that impression – simply there was monstrous fatigue, nerves and so much at stake… not money, but I simply really wanted to win the tournament! Barsky: You were back in the match after winning two games in a row, while the second one was very convincing. What thoughts did you have before the tiebreaks? 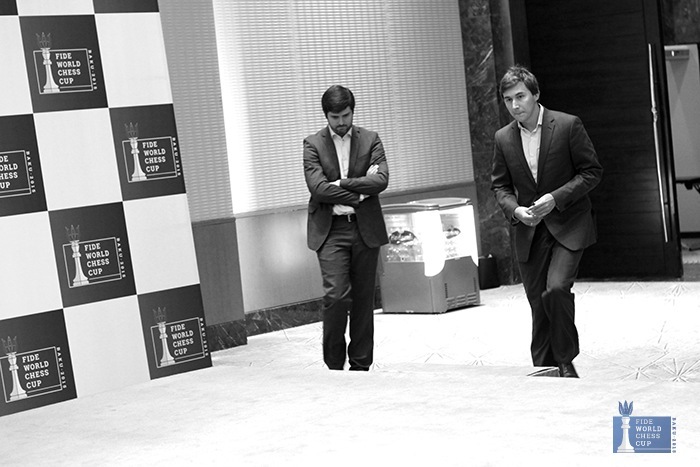 Karjakin: I’d like to make it clear immediately that I had no illusions about the tiebreaks. I considered the chances to be 50:50, because Svidler is no novice who can easily be knocked out of the saddle. He has a wealth of experience and is a 7-time Russian Champion. He’s also lost plenty of games in his life, so nothing tragic had occurred – of course, it was unpleasant for him, but the match went on and I knew that it would be very tough in the tiebreaks.